I have been meaning to make this recipe for a long while now. 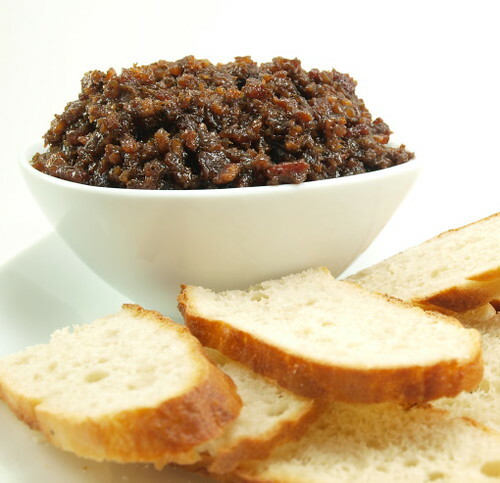 Ever since Kevin on Top Chef and Lisa at Homesick Texan made their versions of bacon jam I have been dreaming of the day when I would make mine. Like any jam you can make it any flavor you like best. I like bourbon and I like maple syrup. 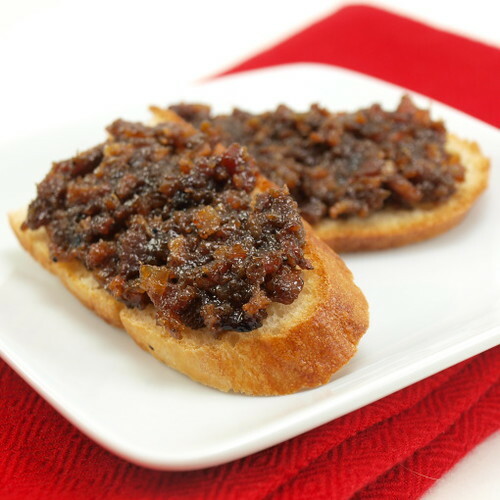 Those flavors, with their earthy caramel notes and natural sweetness, are the perfect foil to salty, smoky bacon. I recommend you get the best quality bacon you can find. If you can find thick cut Applewood smoked I would suggest you use that because it has a nice smoke flavor that will not overpower the jam as the bacon mixture reduces. Good quality bourbon is also a suggestion I would make. Don’t go crazy and use best quality, but please do not use anything in a plastic bottle for this. The maple syrup, however, should not be the very best quality. Any B grade will be fine here because you want the deep maple flavor and the sweetness, but since it is not the star don’t spend the money. 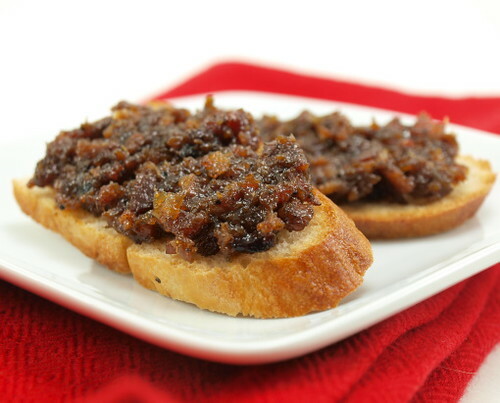 Serve this jam on toast, in a panini, on a buttermilk biscuit, with sliced apples, or with some sharp cheddar cheese. I will not disappoint. 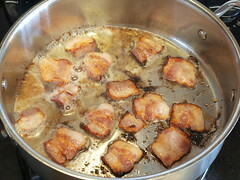 In a large skillet over medium high heat cook the bacon pieces until the begin to crisp at the edges but are still soft in the center, about 1 – 1 1/2 minutes per side. Set aside to drain. 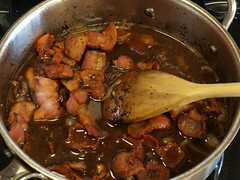 Pour all but one tablespoon of the bacon drippings from the pan. 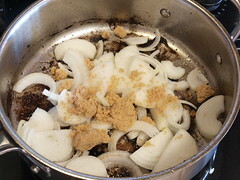 Lower the heat to medium-low and add the onion and brown sugar. 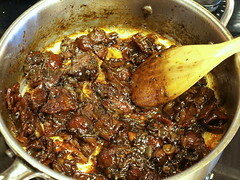 Cook until the onions are well caramelized, about twenty minutes. 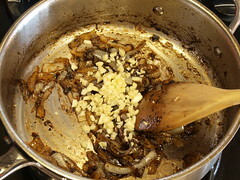 Add the garlic and spices and cook an additional five minutes. Add the liquid ingredients and the bacon to the pan. Increase the heat to medium heat bring the mixture to a boil, then reduce the heat to low and simmer for about two hours. Check the mixture every 30 minutes. If the mixture becomes too dry add a few tablespoons of water. 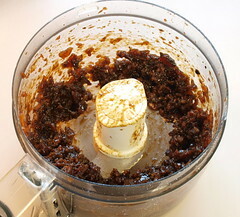 You want the final mixture to be moist and very sticky. 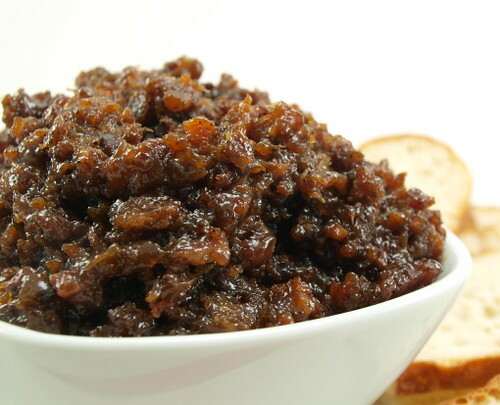 Enjoy, or store in an airtight container in the refrigerator for up to a week.